If you’re keen on botanical expeditions then Portugal is for you. As spring gives way to the gentle Portuguese summer, garden tours in Portugal are one of the loveliest ways to get to know this country. From May onwards, garden-related events take place in several points of Portugal. Starting in the northern region of Minho, where the famous International Garden Festival of Ponte de Lima takes place, and setting out to discover the rebirth of Portuguese botanical treasures, in and around Lisbon. Every year, from the last Friday of May to the end of October, the charismatic town blooms with floral creativity, welcoming the creations of hundreds of landscape and garden artists. The International Garden Festival of Ponte de Lima won the International Garden Festival of the Year 2013 Award at the Garden Tourism Awards – 2013 North American Garden Tourism Conference – in Toronto – Canada. Facing the beautiful Roman-gothic bridge, on the right bank of the river Lima, this festival is a delight for garden enthusiasts, with around 2,5 ha of beautiful gardens set among the existing fruit plants, clinging plants and vines. In fact, Ponte de Lima is one of the most floral towns in Portugal. Don’t miss the chance to visit unique, eccentric private gardens in the surrounding area, by planning your tailor-made garden tour in Portugal with Episode Travel. A mix of eccentricity and heritage, romanticism and exoticness, gardens in Portugal are never predictable. 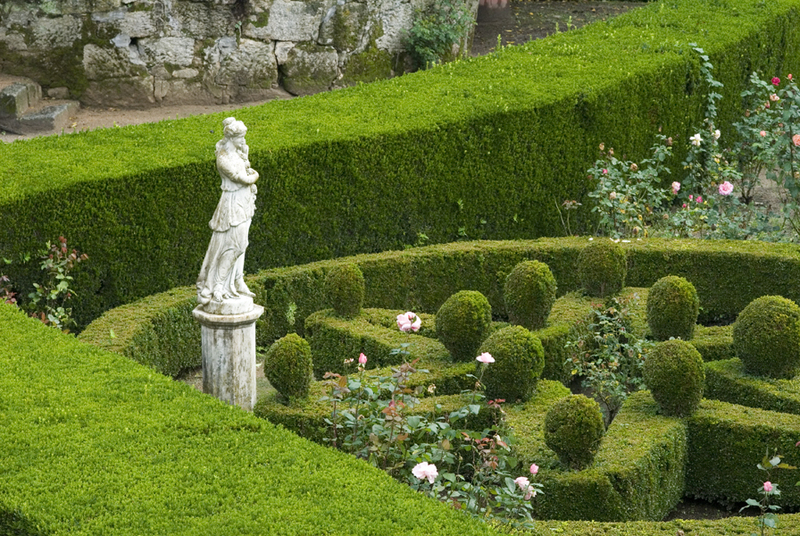 Classic or modern, garden tours in Portugal are an invitation to long walks, contemplation and relaxation. In the mainland or the islands, gardens in Portugal are recognized internationally for their beauty and originality as many of them feature rare botanical species. While historic gardens from are a major attraction, contemporary gardens, such as Serralves, in Porto, and Gulbenkian, in Lisbon, are unmissable landscape gems. Designed in the 18th century, the Botanical Garden of the Queluz National Palace, near Sintra, is one of the jewels of Portuguese landscape art. The Palace, known as the Portuguese Versailles, used to be the summer residence of the Royal Family and its gardens are considered one of the most interesting European gardens. The garden’s composition and layout were lost after a flooding in the 1980’s. Fortunately, the gardens have been restored in full respect for their original composition and recreational character. In recognition of this major intervention, the Botanical Garden of Queluz was honored with the prestigious Europa Nostra Award, EU’s most important prize for Cultural Heritage. The laureates from 17 countries have been recognised for their impressive accomplishments in conservation, research, dedicated service, and education, training and awareness-raising. Launched in 2016, the Santar Garden Village project will soon attract more visitors to the lovely village of Santar, in the center of Portugal. Located near Viseu, in the wine region of Dão, Santar is a small village of 1000 inhabitants, known for its beautiful manor houses and centuries-old palaces. The project, led by architect Fernando Caruncho involves the requalification of 9 historic gardens – Casa de Santar, Linhares, Magnólia, Paço dos Cunhas, Dom Miguel de Bragança and Ibérico Nogueira, among others – which will be restored and united under a single landscape plan. In addition to this, Santar Garden Village will include an interpretative center which will allow visitors to know more about this splendid garden cluster and the extraordinary architectural heritage of the site. Yet another way of discovering Portugal’s wonderful gardens in a program that will soon be included in Episode Travel’s bespoke garden tours in Portugal.